With more people realizing the necessity to carry weapons, finding a way to hide your carry is a must. And while you can easily holster your weapon around your belt, it is not always an option for everyone. Sometimes, a hided carry is necessary in your field of work. With that in mind, wearing belly band holsters instead of traditional belt holsters can be your option. Belly band holsters work just like traditional belt holsters. But instead of wearing them around your belt, you wear them under your shirt and pants. They are worn like belly bands and are usually enclosed with Velcro to close the gap around the waist. There are pockets in these bands where you can holster your weapon. This lets you move around like normal without anyone noticing you are carrying a weapon. If you need to bring guns but you need to hide them, belly band holsters can help. Finding a belly band holster that is not only comfortable, but most importantly concealed, can be a tricky thing. 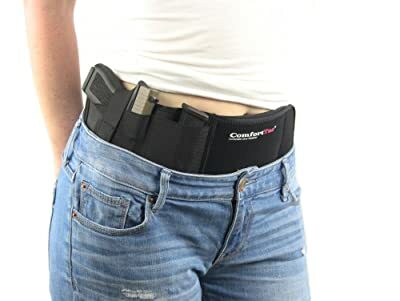 Good thing for women, the ComfortTacUltimate Belly Band Holster for Concealed Carry in Black is a great solution for this dilemma! Many women opt to wear belly band holsters not only to lower their waist size and conceal their carry, but also to support their lower back and abdomen. Comfort’s a big reason in choosing which belly band to buy, and ComfortTac’s neoprene material contributes towards solving this problem. Neoprene, unlike elastic, is soft against the skin while still maintaining elasticity. This results to a product that is not only softer but comfortable as well. 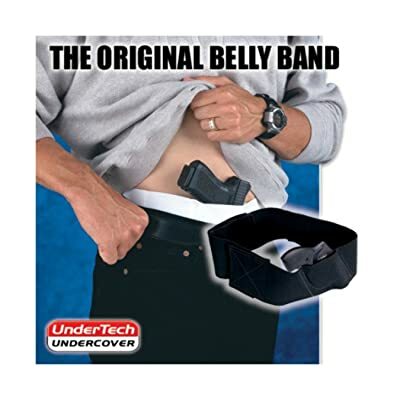 If you are someone who is into carrying guns, the ComfortTac Ultimate Belly Band is definitely a great option for you. With its concealed carry slots available for both left and right hand draw, you can stealthily and comfortably hide your guns. It supports Smith and Wesson, Beretta, Springfield, Kimber, Kel Tec and Walther, among others. Uses a retention strap metal clip instead of Velcro, which means a quieter draw. Made out of neoprene material instead of elastic, providing more skin comfort. Offers spare magazine pocket and optional use retention strap is also provided. Combines both comfort and stealth – you can wear it over gym shorts, loose pants or dress skirts. Thicker neoprene means a bit heavier weight. The holster can be too tight for some guns, making them difficult to fit and draw out. The metal fastener is more tricky to unfasten compared to Velcro. Overall, this product might be a good choice for women who are always on the go and moving around. The comfortable feel this product provides is top notch, and it is also very stealthy for concealed carry. The only tricky thing about this product is the holster size, which can be a bit problematic for fast draws. The metal clip, which substitutes the Velcro, is also trickier to unfasten if you are not used to it. 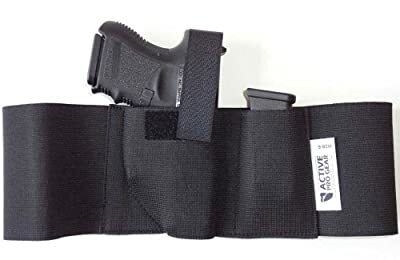 If you are carrying medium-framed to small-framed guns and you want to put some space for an extra ammo too, having a belly band holster is mandatory. And with that in mind, the Active Pro Gear Original Defender Concealment Belly Band Holster is one of the simplest models that you can check out. The selling point of the Active Pro Gear Original Defender Concealment Belly Band Holster is its simplicity. No fancy clips to reveal that you are carrying a weapon. There is no bulky spaces that will add weight to the belly band. No uneven cuts on the holster that will make it difficult to draw. In short, the simple design removes all the unnecessary features – and this makes the Active Pro Original Defender attractive to minimalists. On the other hand, it’s thin profile can also work against you If you are looking for a bulkier belly band with much rigid support. This might work well for you if you’re just looking for a concealment belly band for casual daily activities. One of the nicest features of the Active Pro Defender is its ability to be spun around the waist quickly. This means that your gun can be positioned anywhere around the waist, and uncomfortable positions can easily be fixed. The comfortable and snug fit of the belly band around the waist also means that there is no limit on how low on the waistline it can be placed. If you are looking for a very minimalist belly band holster that does its job, the Active Pro Defender is a good choice. Who said that concealed belly band holsters can’t be stylish too? MEDIUM’s Second Generation Deep Concealed Crotch Carry Handgun Holster is a proof that concealed carry holsters can also look good! Made from soft, light and padded denim, this deep concealed crotch carry is not only stylish but heavy duty as well. The denim is also reinforced with an extra layer of elastic nylon for comfort. The velcro belt makes it easy to take on-and-off, and it the water-resistant layer protects your gun from moisture. The MEDIUM Second Generation Deep Concealed Crotch Carry Handgun Holster has two pockets. One is reserved for the gun and the other is reserved for a spare magazine ammo. What makes it so easy to wear is its ability to give you in-the-waistband or outside-the-waistband access. It can be easily lifted out if you are going to use the bathroom, which is a big plus for women. This belly band can also be pushed down further for an immediate deep-conceal feature. You can also pull out the flap and place it in front of your pants before getting in your car. Doing this gives you access unhindered by the seat belt, which means you won’t have to remove your weapon during transport. Unlike some belt belly bands, this conceal carry holster can be worn during driving. Easy movement and maneuverability – you can even dance while wearing it! The design is better suited for women with longer legs – if you are petite, this might not fit you well. This concealed carry holster might be good for those who are not into belt-type holsters. This might also be a good choice for those who don’t like to take off their holsters too often. With a stylish and ingenious design, we can definitely recommend this product! The Undertech Undercover Belly Band is known as one of the most versatile and most comfortable concealed carry bands available today. Its mantra revolves around its ease of use and practicality. Many people prefer this simplicity over fancy features that often go unused – a big plus if you are always-on-the-go. Whether you are dressing up for office or going to the gym, UndertechUndercover Belly Band can worn stealthily. Totally concealed and ready, this is a great, simple-to-use belly band. Made out of heavy duty elastic enclosed by a Velcro closure, this belly band is rigid. It has two ambidextrous slots which can carry an automatic pistol and a revolver. The 6-inch pocket on the inside can also conceal important papers, cash and credit cards. This is definitely handy if you don’t want to carry your wallet with you all the time. Concealed space for small paper documents, papers and credit cards. If you are looking for a belly band that works great with medium and small frame revolvers, this is a good choice. You might also want this concealed band for semi-automatic pistols such as mini Glocks. SIGs and Beretta. While it can discreetly and comfortably conceal your handguns under a variety of shirts and sweaters, bigger handguns might not go too well with the UnderTech UnderCover Original Belly Band. 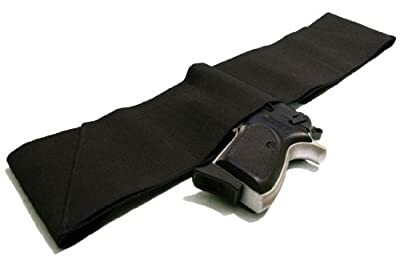 This Four Way Belly Band Gun Holster – Size Medium 33″ – 38″ is as simple and as generic as it gets. Not too many fancy features and not too many bells and whistles – it is just a straight up belly band gun holster. If you are someone who has a waist around 33 to 38 inches, this belly band can be a good fit for you. It has an ultra-comfort 4-inch flexible band that makes it easy to put on and put off. It also supports both left and right hand draws. With this, your favored hand can easily work around drawing the gun smoother and faster. Aside from this, the belly band also boasts of holster pockets hidden inside it. You can put some small items such as cards and documents in it if you need to leave your wallet. Construction is simple and straightforward, which means no bulky and unneeded space. Velcro is tight enough to avoid discomfort but still provide rigid support. Very easy to put on and competitively priced. 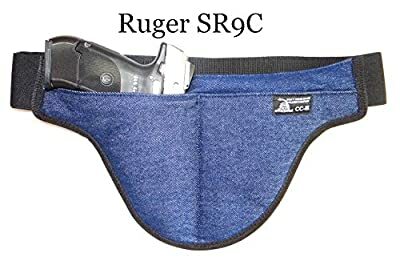 This might be a good belly band for you if you just want a simple holster to carry around without too much bells and whistles. Simply put, this belly band is just as straightforward as it gets. If you want something with more features, there are other products that might be better for you. There are many pros and cons when it comes to belly band holsters, and we will try to tackle each one of them in this section. Below are some of the most common pros and cons that you might want to check before buying one. This is to make sure that belly band holsters are right for you! There are a few points that you have to think about when buying a belly band holster. Concealment, support and comfort, features and weight are just some of them. When buying a belly band holster, it is very important that you choose one that conceals your weapon the best. There is no point in wearing a belly band holster if it easily exposes your weapon to other people. A good belly band holster will hide your weapon whether you are sitting, walking or moving around. Choose a belly band holster than can conceal your weapon properly. Back support is important in choosing the best belly band holster for you. If you can find one that helps keep your back supported all the time, the better. Aside from that, comfort is another strong reason that can sway your decision in buying a belly band holster. Remember, you will be wearing this for the majority of your day. Thus, being comfortable while wearing it is definitely important. Some belly band holsters are stripped down to the core – which means that they simply hold your weapon for you. Some use Velcro for enclosure while some have metal clips too. Some belly band holsters also provide multi-weapon slots for both the left and the right hand. Some even have hidden pockets where you can place cards, papers and documents. Choose well from these features and find the one that best suits your needs. Belly band holsters will add weight to you overall, and you want to minimize this added weight as much as possible. The lighter the belly band, the better and faster you can move around. Choose a belly band holster that is not only comfortable and easy to wear but also very light. Wearing a belly band for long periods of time can be uncomfortable, so make sure you are not carrying a heavy one. Wearing a belly band holster is pretty much straightforward. You just wear it like a belt under your pants and you are good to go! Some belly band holsters are worn like belts and are enclosed using a velcro strap. Because they are easy to wear, this is the most common style that you will find today. While most belly band holsters are worn like belts, there are some that are worn around the crotch area. These velcros are worn by “pulling up”, but they are still hidden safely under your pants – just like your typical belly band. Most belly band holsters are worn under the pants and shirt to conceal them effectively. This means that you have to wear pants that are a size bigger than normal to accommodate the needed space. With that in mind, choosing one that is not only easy to wear but also comfortable is essential. Since you will be mostly wearing them under your pants throughout the day, a light and comfortable one can make a big difference. Belly band holsters are great to help you conceal your weapon while also supporting your back. Finding one that is light, concealed, easy to wear and comfortable is important for these holsters. In all the products that we have reviewed, we can highly recommend the ComfortTac Ultimate Belly Band Holster. Light, easy to wear and enclosed with a metal clip, the ComfortTac Ultimate Belly Band Holster is our top choice. The use of metal clip instead of the usual Velcro gave the holster a much more stable enclosure that doesn’t go out of place quickly. This rigid support is very important if you are an active person who is always on the go.